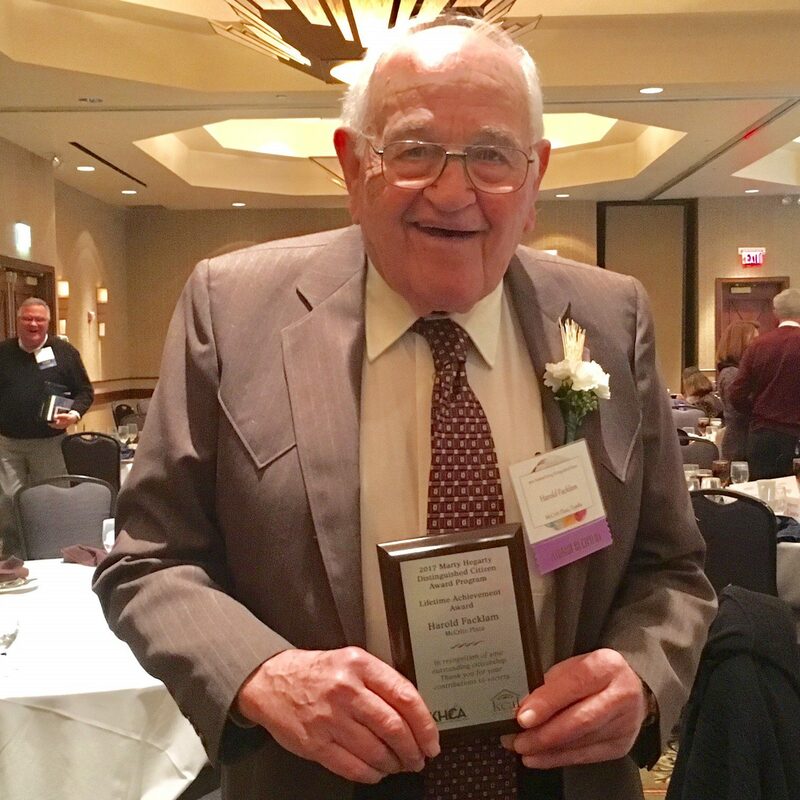 Harold Facklam, 87, Resident of McCrite Plaza Topeka, received the “Assisted Living Lifetime Achievement Award” at the recent KHCA/KCAL Marty Hegarty Distinguished Citizen Recognition Luncheon at the Capitol Plaza Hotel. Harold was honored for his lifetime commitment to donate whole blood through the Geary County American Red Cross. As a member of the American Red Cross “Gallon Club”, Harold has religiously worked to ensure those in Northeast Kansas are not at a loss of blood for emergencies. He began donating blood in January of 1951 and continued to give several times a year, every year, for 68 years! His first blood donation was at age 21 which was the minimum age requirement at that time. Over the next 68 years, Harold gave a total of over 32 gallons of blood, making him the largest donor in Geary County history! Additionally, Harold was recognized for his volunteer work with the United Church of Christ (Geary County) in spearheading the committee that rebuilt the church after it was destroyed by lightening in 2001. Harold and his wife of 66 years, Venice, reside at McCrite Plaza Topeka. To learn more about McCrite Plaza, please contact us.